With Ms Dynamite filling up column inches faster than the media can write them, it's easy to forget what a successful 12 months Beverley Knight has had. 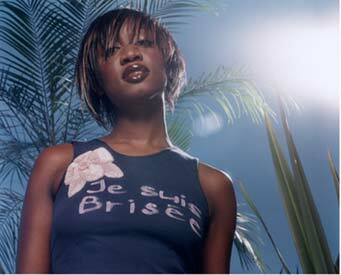 Following the success of her "Who I Am" album Knight has gone onto receive two nominations for Best British Female and Best Urban Act at this years Brit Awards and a week later she releases "Shape Of You (Reshaped)" with Wyclef Jean. 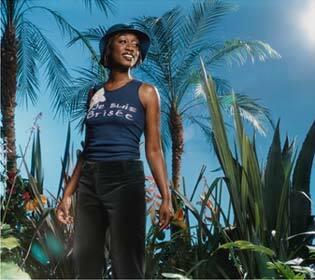 Designer Magazine caught up with Beverley Knight to find out just where she goes from here. Q: In terms of recognition last year was undoubtedly your year. How was that for you after plugging away for years? A: I think it was more Ms Dynamite's year, but I had a good year and a year where I felt a lot more people knew me and knew at least one of my songs by the end of last year. I think the best thinks were when I realized that the album had been so well received by the public I was thrilled and having a chance to meet with Nelson Mandela for the second time was great. You always have hopes when you release an album, but back in January when I was just gearing up for the Jamiroquai tour I could never imagine all this would have happened especially the Mercury Music Prize nomination. In my career it's been a case of everything is ticking over nicely, that is how it's gone for me, and there was a real groundswell of support when the album was released and I hadn't imagined there were that many people that would be interested. Q: Looking around now with R&B and Urban music as a whole being so successful, it's hard to imagine a time when this wasn't the case. What was it like for you in the early days? A: I was the only one out there making British music that was of a street nature and believe me I was the only one and not many people wanted to no. It was tough. When I came out with "Flava Of The Old Skool" in 94 there wasn't loads of things going on either in the US and certainly not over here. Music had kind of come to a point where it had to change and it was the whole thing of British Street Soul, which I still prefer because I think I'm a soul artist with a street edge, and then the thing that changed everything was when when Mary J Blige released her 2nd album and then D'Angelo released his 1st album which were much more raw and organic in their feel. From that point in I looked at those two albums and thought this is definitely going in the right direction - I felt inspired!!! Q: I guess prior to yourself it was only really Mica Paris and Omar? A: Because they were the generation above me. It was Mica, Soul 2 Soul and Loose Ends and we tend to thing of those as being in the 80s and then there as nothing!!! And then "Flava" came out and that's when bit by bit it all started to happen and now we've got 2003 and the biggest category in the Brits is this "Urban" category with 10 acts. And some of them are not very mainstream sounding like the Streets and Roots Manuva. It's wild to see where it's gone and I was there at the beginning of it and I'm still here now. Q: So how do you feel being nominated for the Best British Female and Best British Urban Artist category at the Brit Awards 2003? A: I feel that it's nice to get the nomination in terms of to put a spotlight on the album and to so people remember that I have got an album out. I shall go along and just enjoy the show but when people are asking me what my chances are it's like you've got the wrong British Female, mate!!! Q: The tour in December was yourself with Rhianna supporting and to me it was two independent women out in a tour de force. What that how it was planned? A: You don't find a lot of tour where you've got the main act and the support act both being female. Were not similar musically, but she's obviously someone who has the courage of her convictions going out there touring with a band trying to build up a fanbase and writing the songs herself. A similar work ethic to me if you like. What you normally find is that the label wants, with me being a girl, they want a guy so there is this rivalry. At the London show there was myself, Rhianna, Lemar from Fame Academy and Blak Twang up on stage for the encores. The thing about Lemar is I don't like those reality TV shows at all, but I caught this boy with this voice on the programme and because I was so out of touch I didn't know what it was or anything. So I did my research and I thought he had the most fantastic voice ever. I just wanted people to hear this great voice. Q: On a totally different tip from the music you went out to Brazil with Christian Aid at the tail end of last year. Could you tell us a little bit more about that? A: It was harrowing. Seeing desperately ill children in such distress yet smiling through it all. It takes something out of you. I went over there as an Ambassador for Christian Aid to highlight some of the problems that poverty and to put the spotlight on HIV and Aids awareness and the work that has been done over there. I learnt just how apathetic we are over here and it's so not the vogue topic of conversation. Certainly when I think of those kids that are living with it now I just feel it's a responsibility to highlight the issues. I don't take the position lightly and I think it's a big responsibility that if I can do something then I should. Only on issues that I feel strongly about otherwise if I go out there and speak about issues I don't feel strongly about I can not only be ineffective, but damaging. The reason being is that my dearest greatest friend is desperately ill at the moment and he is HIV+ and that's why I feel the way I do about it. Q: You've got the single "Shape Of You (Reshaped)" out on February 24th. Totally reworked with Wyclef on production duties. How was it working with a genius? A: I really enjoyed the time in the studio with him and shooting the video. We turned the song on it's head because it started with the idea that we were just going to remix it, but then we remade it and ran with it. So what we ended up with was 2 different songs with the same title if you see what I mean. That's where similarities end. Q: The album's been out for a while now. Are you starting to think of the next album yet and is there any pressure with the success of "Who I Am"? A: I've already started to write the next album. Again it will be as eclectic and broad with it's feel and reach as "Who I Am", but it will be rawer because there's a lot of sensitive issues that I need to write about. Music is my therapy and that's how I get by and there's a lot I need to get out through my music on this next album. Expect a very honest album and expect a rawer sound.